Documentaries are often labeled as “boring,” “methodical,” and worse, “educational.” But thanks to the work of filmmakers Zana Briski and Ross Kauffman, “Born Into Brothels” is a lively, suspenseful, even joyous experience. 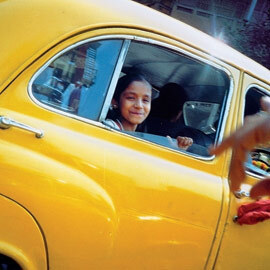 Children from Calcutta brothels take their cameras out on the town. Not many movies can plausibly suggest they will “change your life,” but “Brothels” might do just that. As bright as a box of new crayons, and just as full of creative potential, the children in “Brothels” give us vibrant pictures of hope in the midst of oppression. Th is movie joins a surge of recent works that are winning reality-cinema an enthusiastic new audience through creativity and innovation. Here’s a scene: We’re in the Red Light district of Calcutta. Our vantage point is a documentarian’s camera in a filthy building where prostitutes live and work, sacrificing their bodies for money so they can feed theirmothers (retired prostitutes) and their children (prostitutes-in-training). The kids cower in the corners and watch, wide-eyed, as this cruel cultural cycle plays out before them. Men, poisoned by drugs and alcohol, lurk in the streets like zombies. Women in vibrant clothing preen and strut and compete for their attention. In the middle of this, a prostitute pauses to wash her son’s hair, and becomes entangled in a vocal, expletive-laced debate with another woman over which of them is more depraved and wicked. Momentary concern flickers in the children’s eyes, but they don’t run or cry. They’ve seen this before. In “Born Into Brothels,” which won Best Documentary Feature in the 2005 Academy Awards, Briski and Kauff man guide us, like Virgil educating the horrified Dante, down into an abyss of poverty and depravity. Briski went to Calcutta to photograph the harsh realities suffered by the women there: female infanticide, sexual abuse, child marriage, dowry deaths, widowhood. But after spending years with the children of the brothels, she realized, “I wanted to do something for them.” She put down her own camera, gave point-and-shoot cameras to the kids, and began a weekly workshop. We watch as remarkable things begin to take place. Turned loose with their cameras, on the streets or behind closed doors, the children grow in confi dence, creativity, and personality, expressing themselves with dazzling, revelatory images. Some prove to have extraordinary talents. We’re treated to an exhibition: zoo animals, friends playing on the beach, tormented addicts, unexpected details on the floors and the streets, blurred activity captured through car windows, secrets and wounds and fleeting joys reflected in the faces of other children. “Brothels” documents Briski’s and Kauffman’s increasing passion as they seek escape routes for their students. They appeal to boarding schools that usually reject the children of criminals. They fight for birth certificates and ration cards. They nervously await the results of boys’ and girls’ HIV tests. This may sound like an unpleasant way to spend two hours. But the overall effect of the f lm is quite different. Seeing the world through the lenses of young eyes, we are blessed by how they see. Moreover, Briski and Kauff man take us above and beyond the standard lecture about need and hope. The idea is this: When you actually encounter these children face to face, spend time with them, learn their names and their voices, see them laughing, and discover their creative potential, your perspective will be changed. When you see two Westerners walk in and make a tremendous difference to one, two, three, and more children, you may feel a tug at your own conscience. And when you learn, in the closing moments, where these children are today, your heart may well break open. There are several other recent documentaries of similar value as well. Mirroring Briski’s social conscience, a drama teacher named Catherine Borek strives to ignite ambition and courage in a group of apathetic, cynical students in “OT: Our Town,” available on DVD. Filmmaker Scott Hamilton gives us a chronicle of high school students in Compton, California, as they attempt to mount their first live theatre production in 20 years — a contemporary take on Thornton Wilder’s “Our Town.” Borek’s dedication to inspire creative discovery and racial reconciliation in a community where gunshots and race riots are daily realities is a testament to the power of art, “tough love,” and courageous teachers. “Born Into Brothels” is making its way through theatres around the country. It has played in Seattle since January and arrives on DVD this summer. — PHOTO COURTESY OF THINK FILM COMPANY INC.
Raised between two cultures, musician William Chapman Nyaho finds a way to bridge them. spective showing 20 years of creative genius. The Falcon women's basketball team reached the NCAA title game for the first time in the team's history. For 1966 graduate Chi-Dooh �Skip� Li, the tragic case of Terri Schiavo hit close to home. art makes its online debut with a painting by an SPU adjunct professor of art.